Sourgrass (Digitaria insularis) is a monocot weed in the Poaceae family. In Brazil this weed first evolved resistance to Group A/1 herbicides in 2016 and infests Soybean. Group A/1 herbicides are known as ACCase inhibitors (Inhibition of acetyl CoA carboxylase (ACCase)). Research has shown that these particular biotypes are resistant to fenoxaprop-P-ethyl, and haloxyfop-P-methyl and they may be cross-resistant to other Group A/1 herbicides. Greenhouse, and Laboratory trials comparing a known susceptible Sourgrass biotype with this Sourgrass biotype have been used to confirm resistance. For further information on the tests conducted please contact the local weed scientists that provided this information. There is no record of differences in fitness or competitiveness of these resistant biotypes when compared to that of normal susceptible biotypes. If you have any information pertaining to the fitness of Group A/1 resistant Sourgrass from Brazil please update the database. The Herbicide Resistance Action Committee, The Weed Science Society of America, and weed scientists in Brazil have been instrumental in providing you this information. Particular thanks is given to Marcel Sereguin Cabral de Melo for providing detailed information. Carvalho, L. B. de ; Alves, P. L. da C. A. ; González-Torralva, F. ; Cruz-Hipolito, H. E. ; Rojano-Delgado, A. M. ; Prado, R. de ; Gil-Humanes, J. ; Barro, F. ; Luque de Castro, M. D.. 2012. Pool of resistance mechanisms to glyphosate in Digitaria insularis. Journal of Agricultural and Food Chemistry 60 : 615 - 622. Digitaria insularis biotypes resistant to glyphosate have been detected in Brazil. Studies were carried out in controlled conditions to determine the role of absorption, translocation, metabolism, and gene mutation as mechanisms of glyphosate resistance in D. insularis. The susceptible biotype absorbed at least 12% more 14C-glyphosate up to 48 h after treatment (HAT) than resistant biotypes. High differential 14C-glyphosate translocation was observed at 12 HAT, so that >70% of the absorbed herbicide remained in the treated leaf in resistant biotypes, whereas 42% remained in the susceptible biotype at 96 HAT. Glyphosate was degraded to aminomethylphosphonic acid (AMPA), glyoxylate, and sarcosine by >90% in resistant biotypes, whereas a small amount of herbicide (up to 11%) was degraded by the susceptible biotype up to 168 HAT. Two amino acid changes were found at positions 182 and 310 in EPSPS, consisting of a proline to threonine and a tyrosine to cysteine substitution, respectively, in resistant biotypes. Therefore, absorption, translocation, metabolism, and gene mutation play an important role in the D. insularis glyphosate resistance..
Cerdeira, A. L. ; Gazziero, D. L. P. ; Duke, S. O. ; Matallo, M. B.. 2011. Agricultural impacts of glyphosate-resistant soybean cultivation in South America. Journal of Agricultural and Food Chemistry 59 : 5799 - 5807. In the 2009/2010 growing season, Brazil was the second largest world soybean producer, followed by Argentina. Glyphosate-resistant soybeans (GRS) are being cultivated in most of the soybean area in South America. Overall, the GRS system is beneficial to the environment when compared to conventional soybean. GRS resulted in a significant shift toward no-tillage practices in Brazil and Argentina, but weed resistance may reduce this trend. Probably the highest agricultural risk in adopting GRS in Brazil and South America is related to weed resistance due to use of glyphosate. Weed species in GRS fields have shifted in Brazil to those that can more successfully withstand glyphosate or to those that avoid the time of its application. Five weed species, in order of importance, Conyza bonariensis (L.) Cronquist, Conyza canadensis (L.) Cronquist, Lolium multiflorum Lam., Digitaria insularis (L.) Mez ex Ekman, and Euphorbia heterophylla L., have evolved resistance to glyphosate in GRS in Brazil. Conyza spp. are the most difficult to control. A glyphosate-resistant biotype of Sorghum halepense L. has evolved in GRS in Argentina and one of D. insularis in Paraguay. The following actions are proposed to minimize weed resistance problem: (a) rotation of GRS with conventional soybeans in order to rotate herbicide modes of action; (b) avoidance of lower than recommended glyphosate rates; (c) keeping soil covered with a crop or legume at intercrop intervals; (d) keeping machinery free of weed seeds; and (d) use of a preplant nonselective herbicide plus residuals to eliminate early weed interference with the crop and to minimize escapes from later applications of glyphosate due to natural resistance of older weeds and/or incomplete glyphosate coverage..
Carvalho, L. B. de ; Cruz-Hipolito, H. ; González-Torralva, F. ; Alves, P. L. da C. A. ; Christoffoleti, P. J. ; Prado, R. de. 2011. Detection of sourgrass (Digitaria insularis) biotypes resistant to glyphosate in Brazil. Weed Science 59 : 171 - 176. 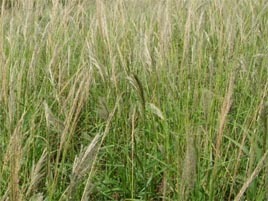 Sourgrass is a perennial weed infesting annual and perennial crops in Brazil. Three biotypes (R1, R2, and R3) of sourgrass suspected to be glyphosate-resistant (R) and another one (S) from a natural area without glyphosate application, in Brazil, were tested for resistance to glyphosate based on screening, dose-response, and shikimic acid assays. Both screening and dose-response assays confirmed glyphosate resistance in the three sourgrass biotypes. Dose-response assay indicated a resistance factor of 2.3 for biotype R1 and 3.9 for biotypes R2 and R3. The hypothesis of a glyphosate resistance was corroborated on the basis of shikimic acid accumulation, where the S biotype accumulated 3.3, 5.0, and 5.7 times more shikimic acid than biotypes R1, R2, and R3, respectively, 168 h after treatment with 157.50 g ae ha-1 of glyphosate. There were no differences in contact angle of spray droplets on leaves and spray retention, indicating that differential capture of herbicide by leaves was not responsible for resistance in these biotypes. The results confirmed resistance of sourgrass to glyphosate in Brazil..
Lopez-Ovejero, R. F. ; Fonseca, L. B. ; Galli, A. J. B. ; Christoffoleti, P. J.. 2009. Weed resistance to the herbicide glyphosate in Brazil (update and mitigation). : 469 - 472. The glyphosate was released commercially in Brazil in 1978 and has been used in the weed dessecation of the conservation system no tillage, as well as in the non selective weed control in perennial and semi-perennial crops (sugarcane, fruit crops and forestry). However, the application of glyphosate was intensified significantly with the advent of genetically modified tolerant crops to this herbicide. Despite its intensive use in the Brazilian agriculture, the first reported case of weed resistance to glyphosate in Brazil was recent (2002/2003). In Brazil, according to the established procedures by HRAC, the selection of resistant populations to glyphosate was scientifically confirmed in four weed species: Lolium multiflorum (2003), Conyza bonariensis (2005), Conyza canadensis (2005) and Digitaria insularis (2008). The report on the population selection of the weed Euphorbia heterophylla in the Southern region of Brazil was not confirmed and research show that if the specified recommendations in the glyphosate lable were followed, either in pre-seeding for the no tillage cropping system establishment (dessecation), as for post seeding in areas of tolerant crops to glyphosate, the control of this weed by glyphosate is effective. Due to the positives attributes it is predictable that glyphosate will continue to be dominant herbicide in the Brazilian agriculture. To guarantee the sustainability of its future use, a stewardship program was developed for this herbicide..
Christoffoleti, P. J. ; Nicolai, M. ; Dias, A. C. R. ; Melo, M. S. C. ; Lopes-Ovejero, R. F. ; Galli, A. J. B.. 2009. Evaluation of the suspect of resistance of the weed bitter grass (Digitaria insularis) to glyphosate in citrus orchard of Sao Paulo state, Brazil. : 533 - 536. This research was conducted with the objective of evaluating comparatively the susceptibility of two populations of bitter grass (Digitaria insularis) to the herbicide glyphosate in citrus orchards in Brazil. Two trials were conducted in the greenhouse conditions, both with the supposedly susceptible populations (S) from Piracicaba county - SP, Brazil, which seeds were collected from an area without history of repetitive application of glyphosate, and a population supposedly resistant (R) from an area of citrus production with an history of 15 years of glyphosate application, located in Matao county - SP, Brazil. The herbicide treatments were sprayed in the stage of 5 to 6 tillers, with 12 to 15 cm of height in both populations. The treatments with glyphosate (a e.a. ha-1) for the trial one were: 5,760; 2,880; 1,440; 720; 360, 180 and 90, as well a check plot without herbicide application, and for the trial 2 the rates were: 12, 9, 6, 3 L ha-1, and check without herbicide. The results were adjusted to dose response curves and confirmed the resistance of the population R to glyphosate..